This adorable little lady’s name is Ehani, and she lives in Nepal. She is the first of many portraits I will be doing for The Timothy Initiative (www.ttionline.org), a ministry that shares the love of God through its gospel outreach. 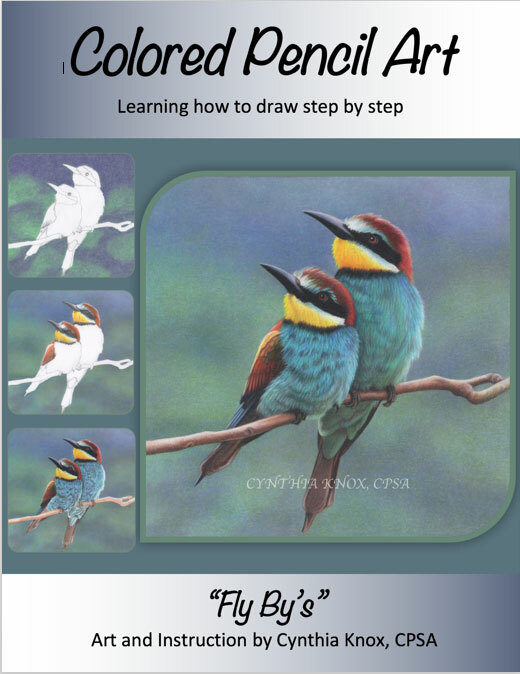 For each portrait there will be a step-by-step instructional booklet that I will offer online and at my workshops. 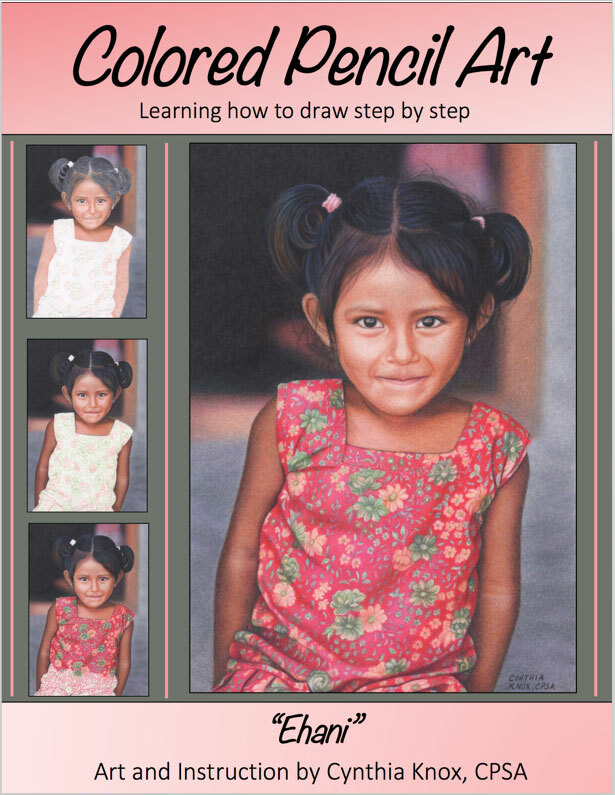 In this portrait project you will learn in 12 steps how to blur backgrounds, create realistic skin and hair textures, contour and highlight facial features, and render a patterned dress with folds and pleats. Included are clear step-by-step instructions, a supply list, the project outline, and lots of tips to advance your current skill level. Once you complete your payment, you’ll receive an email from SendOwl with a link for you to download and print out the tutorial. There will be 3 downloads available. If after a few minutes you do not receive an email, please check your junk folders for it. If you have any problems, just contact me at cknox1@nycap.rr.com. I believe you’ll enjoy bringing this sweet young girl to life and would love for you to tag me if you post it on social media sites! This colorful bird portrait is an absolute joy to render with colored pencils! And if you’ve wanted to try the new creamy PanPastels, here’s your chance since only three PanPastel colors are needed for the entire background. I’m pretty sure you’ll fall in love with this dreamy pastel medium. Learn how to create fluffy feathers, realistic wood, and facial features with colored pencils as you work your way through the 28-page tutorial. Included are clear step-by-step instructions, a supply list, the project outline, and lots of tips to advance your current skill level. Once you complete your payment, you’ll receive an email from SendOwl with a link for you to download and print out the tutorial. There will be 3 downloads available. If after a few minutes you do not receive an email, please check your junk folders for it. If you have any problems, just contact me at cknox1@nycap.rr.com. I hope you enjoy creating this project as much as I did! Dahlias are beautiful flowers to paint, and this one from a castle garden in Ireland is no exception. 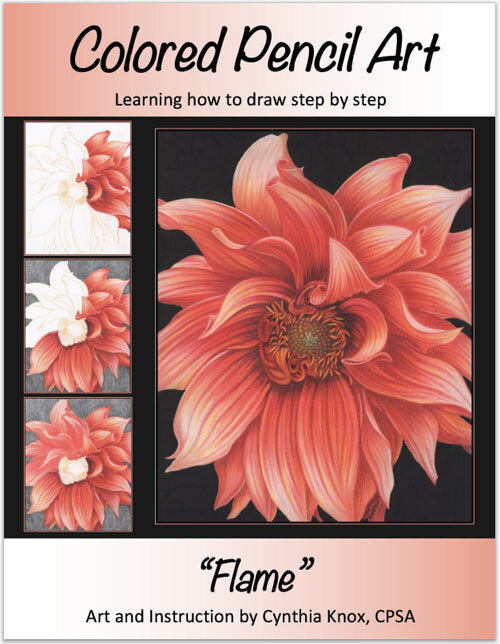 Learn how to render each petal, the detailed center, and the jet black background with 15 colored pencils. 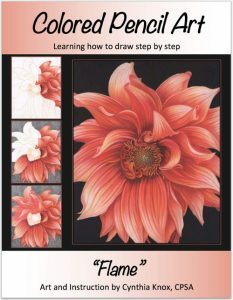 Included are clear, step-by-step instructions, a supply list, the project outline, and tips to help you create your own floral masterpiece. Once you complete your payment, you’ll receive an email from SendOwl with a link for you to download and print out the tutorial. There will be 3 downloads available. If after a few minutes you do not receive an email, please check your junk folders for it. If you have any problems, just contact me at cknox1@nycap.rr.com. Enjoy working on this vibrant colored pencil project! If you love puppies and kittens, this project is for you! We’ll work together creating fur that grows in every possible direction. 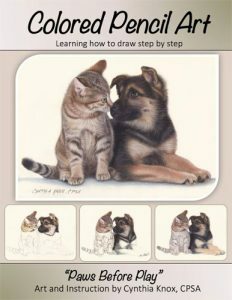 Short, wispy fur and longer, sleek fur are developed step by step throughout this 24-page tutorial, and I know you’ll be delighted with the outcome. Included are clear directions with color photos, a supply list, the project outline, and tips to advance your current skill level. Ahhh, can you just feel the sun on that sandy beach?! 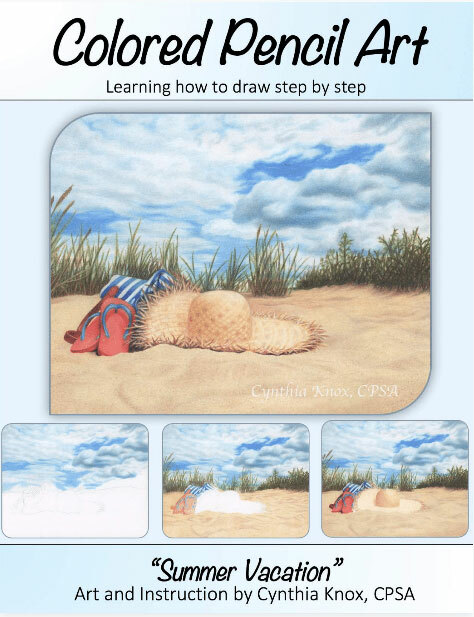 If you’re in the mood for the seashore and not anywhere near one, join me and create this lovely beachscape in colored pencil. I’ll lead you through the project step by step and show you how to create clouds, sea grass, sand, flip flops, towel fabric, and that lovely sunlit straw hat. Included are clear directions with color photos, a supply list, the project outline, and tips to advance your current skill level. Do you know any baseball fans who would love to receive this from you? 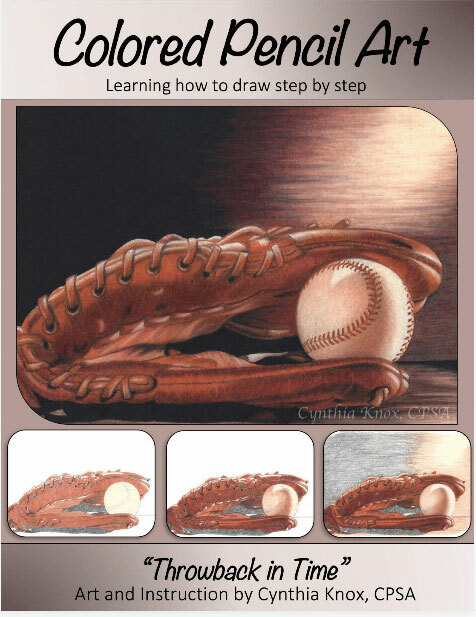 I’ll lead you through the project step by step and show you how to create soft, distressed leather over the glove and smoothly stretched leather with lace stitching over the ball. We’ll create a dramatic background and soft wood surface to stage this nostalgic subject properly. Included are clear directions with color photos, a supply list, the project outline, and tips to advance your current skill level.